We surveyed the 2017 riders to get a White Rose Classic review and scorecard. Riders had many different experiences out on the road. My perspective, as the Event Organiser on the day of the event, was probably jaded. 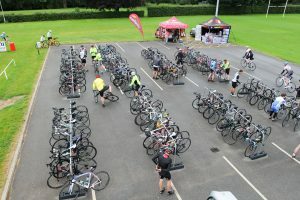 I heard mostly about issues riders ran into and challenges faced by the army of nearly 100 volunteers from the Ilkley Cycling Club. To get an accurate assessment of the the experience riders had, we decided to survey the riders and ask them directly. The survey response was strong, with nearly 20% of people who were out on the day sharing their opinions. Here is a taste of what we learned. First the good news: most people had a great time. We asked riders to give an overall rating for the event from 0 to 100. Most people had a good, or really good, day out, since the average response was an 86. We feel pretty good about that. But, of course, not everyone was happy and some simply did not have a good day. Out of 137 responses, 7 gave a value of 50 or less, and one was an embarrassingly low 5. We allowed plenty of space for people to share details of their experience. Nevertheless, it can be a challenge to tease out what went wrong for any individual. We learned about some things that did not go well for enough people that it showed up clearly in the survey. We asked, “If your experience was less than perfect, what issues did you have?” Hands-down, the biggest problem was finding their way around their chosen route. The White Rose Classic has 3 distinct routes covering a total of over 140 miles in the Yorkshire Dales. We put in a massive effort to put up signs and provide .gpx files in advance to load into a bike computer. Yet, we clearly did not get it right this year. More than half of the riders singled out, “Routes and signs” as a source of frustration. There was also some lingering frustration with the process around Sign On in the morning of the ride. However, less than 20 people flagged this issue. The good thing is that we can easily address the issues with the signs and morning Sign On. We are already working on on both of them. We have printed new, high-visibility signs, and the Sign On process will be greatly streamlined. The upshot of our White Rose Classic review is that we have some work to do to improve the signage and to make it faster to get out on the road in the morning. For a lot of other things, like the Feed Station food, we just have to concentrate on doing as good a job as we did last June.